Abraham’s Advent Christmas Devotional by Lindsey Gallant – Selah. 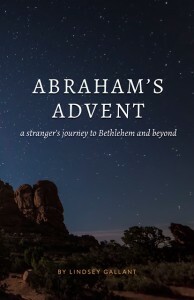 Lindsey Gallant has released her devotional Abraham’s Advent in ebook format for a token donation amount. I’m so excited to be announcing this devotional ebook and fundraiser for Preemptive Love Coalition! Get your beautifully designed copy of the devotional Abraham’s Advent: A Stranger’s Journey to Bethlehem and Beyond. It is now available to download as a PDF or EPUB file for $2.99 (CDN). This devotional is meant to be a humble companion as you journey through the Advent season. It follows the story of one man who learned to live within the promises of God. But it can be your story too, if you are willing to sit awhile by a Bethlehem fire. Proceeds from this ebook are going to Preemptive Love Coalition and the amazing, life-changing work they are doing in Iraq and the Middle East. In places of darkness and desperation, they are healing hearts, waging peace, and loving anyway. Find out more here. Find out more on Lindsey’s Red Letters Blog.